How to Convert Recipes for Pressure Cooking: A look at which recipes are suited for pressure cooking and how you can take those traditional recipes and convert them to Instant Pot success! 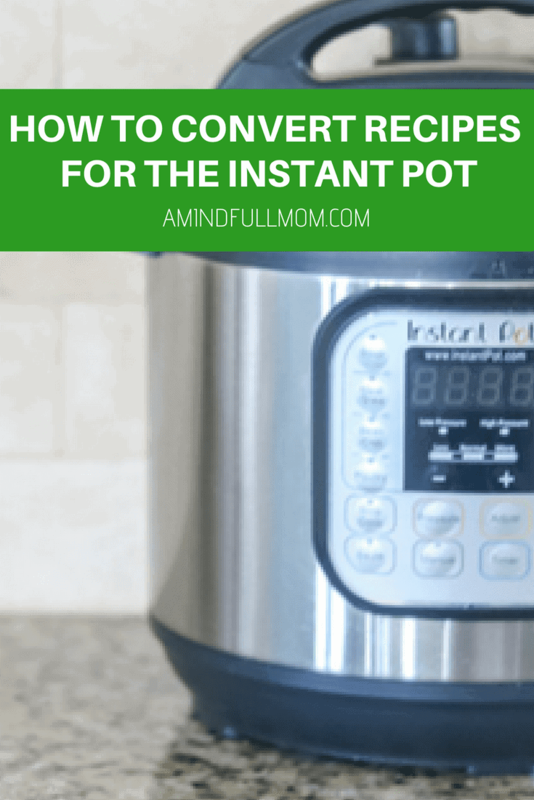 One of the most frequently asked questions I get is How can I make (fill in the blank) in the Instant Pot? 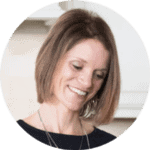 But in the meantime, let me share my tips AND my list of cautions, so that you can begin to feel confident in converting your family recipes for the Instant Pot. Not everything should be cooked in the pressure cooker. There are some dishes, like fried chicken or a juicy filet that should never be attempted in a pressure cooker. Find out more about what NOT to cook in your Instant Pot. However, Instant Pots excel at making inexpensive cuts of meats tender, like Instant Pot French Dip Sandwiches, and making soups or Chili in a short amount of time that taste as though they have simmered all day. *Again refer to what NOT to cook in the Instant Pot for more detailed explanation. Once you decide if your recipe is suitable for pressure cooking, you need to decide on a few things. It is relatively easy to determine if you need to cook on high or low pressure. The majority of recipes are cooked on high pressure. The only time low pressure is used is for delicate cuts of seafood, or a light steaming of vegetables. Remember you do NOT need to use the various functions on the instant pot–just manually adjust the pressure and cook time yourself. 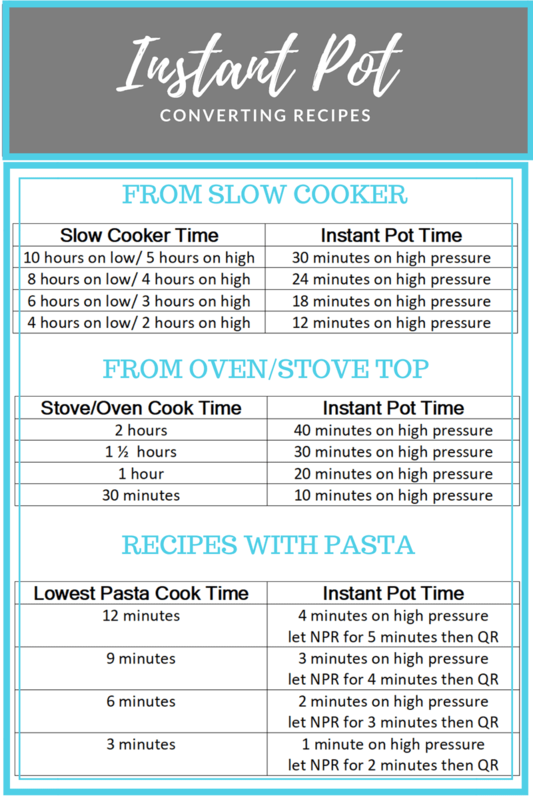 This is where it can seem overwhelming and tricky to figure out how long to cook things in your instant pot. Cut the cook time for meats, soups, and vegetables by two-thirds of total cook time. (So for 60 minutes you would cook on high for 20 minutes.) A simpler way to state this is to divide the total time by 3 and that give you cook time on high pressure. For recipes with pasta, it can be a bit more tricky. I have heard it said to cut the cook time on pasta in half, but in my experience, it is better to cut the LOWEST suggested cooking time by two-thirds, let naturally release for another third of total original time + 1 minute and then do a quick release. See a bit complicated. For example, rotini pasta says it needs 12-13 minutes to cook. I divide 12 by 3 which gives me 4. I cook my pasta for 4 minutes, then let naturally release another 1/3 total time + 1 minute–which in this case would be 5 minutes (4 +1). See complicated, but NOT impossible! I have already addressed how to use your Instant Pot as a Slow Cooker, but what about making a slow cooker recipe into an instant pot recipe–cooked faster? Refer to the amount of time that a recipe needs to cook on high and covert from hours to minutes (multiply it by 60) then divide by 10. You would cook your recipe for 24 minutes on high pressure. If you are using frozen meat, increase cooking time by 5-10 minutes. Should you use NPR or QR for your recipe? Once you have established pressure setting and cook time for your recipe in the pressure cooker, now you must address if you need to use natural pressure release or quick release. Use NPR (natural pressure release) for soups, starchy dishes, tough cuts of meat. Use QR (quick release) for delicate cuts of meat, pastas, and quick cooking vegetables. Still Confused about converting recipes? Let me explain things a bit for you! What if you recipe is not cooked fully after time has elapsed? Simply, put your lid back on the pressure cooker and set to cook on high for 3-5 minutes and make notes for the next time you make the recipe. Be sure to add enough liquid. All recipes need at least 1 cup of liquid in them to achieve the right pressure. 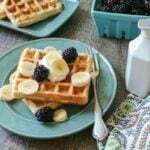 Do NOT add cornstarch, flour, or dairy products. These ingredients can cause burn warnings and will not allow your pressure cooker to reach pressure. Add a cornstarch slurry (2 parts liquid to 1 part cornstarch) at end of cooking time and let thicken on saute function for a minute or two. Do NOT overfill your pressure cooker. Never fill inner pot over 2/3rd of the way full with liquid. Never fill inner pot over 1/2 way full when cooking rice or beans. And finally, I would NOT experiment with recipes BEFORE you try out a few recipes that have been tested by others. Once you are familiar with pressure cooking, then you can start to experiment. Be sure to keep notes and document any changes that need to be made so that you have your own point of reference for recipes in the Instant Pot. Okay, now that you have that down, I want to know–what are you anxious to make yourself? This is invaluable information. It’s tricky enough to convert a regular recipe to the instant pot, but I had no idea where to start with a crock pot recipe. I have been itching to try some of my slow cooker soups in the instant pot and now I know how thanks to all your time researching and figuring this out. Your conversion times are right on! I tried one of our favorite soups and it tasted like it had slow cooked all day at a fraction of the time. The pulled pork was even juicier and more tender than when I make it in the slow cooker. Thanks again!! Oh thank you so much for sharing! 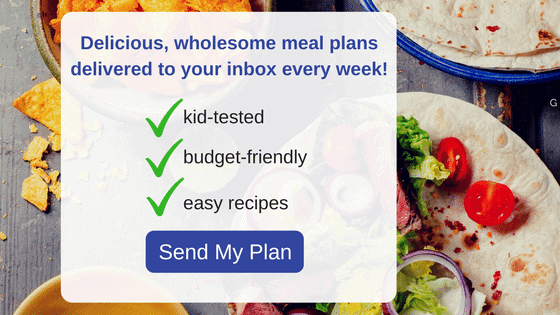 I am SO grateful you are able to use this information to help feed your families easier! Wonderful information, especially for an IP newbie like me! Thank you! Excellent article for this newbee…conversation chart outstanding…THANK YOU. You are welcome. So glad you found this helpful as Instant Pots can be overwhelming. This is very organized and extremely helpful for this instant pot newbie! Thanks!! I am SO glad to hear that Sherry! My aim is to make this EASY! Are there recipes for cooking for two available for the instant pot? Hi Linda! Most recipes can be adapted for only 2 servings. Do you have a mini or 6 quart instant pot? I have tried a few recipes from this Pressure Cooker Cookbook for 2 on amazon: https://amzn.to/2RCNqKO with success too.